Although production has dropped significantly in recent times, Invisible Paris can nevertheless blow out the candles on a 10th birthday today (September 17)! I began the blog a decade ago with little more in mind than giving focus and structure to my random wanderings around Paris, and its purpose and ambition has changed little since then. The blog is more invisible than ever today, but survives, and still plays a role in my life. Indeed, starting the blog in 2008 turned out to be a life-changing decision for me in many ways. Over the decade, I have explored and researched hundreds of places in Paris, and through the blog I have met and collaborated with dozens of fascinating people. The blog has helped me get published in magazines and newspapers, got me featured on a TV programme and led to me writing a book. Most of it was unplanned, with publications generally stemming from random encounters, lines read in books, buildings seen in different lights or e-mails popping into my inbox. 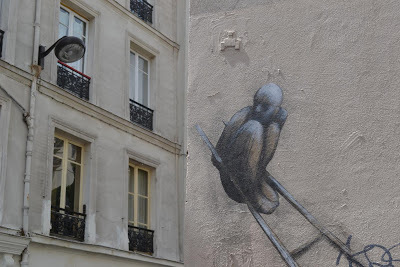 The blog goes on because Paris continues to fascinate, inspire, infuriate, and pose questions, and because most of the city still remains invisible. I have no idea what the next 10 years will bring, but here are the ten things that have most marked the blog for me so far. The first post I wrote was about an archetypal ‘invisible’ building in Paris, a structure that is at once functional and attractive, unusual but camouflaged in its environment. It is a historic survivor, but also one that serves a modern purpose. I still love this building, but still haven’t seen what it looks like from the inside, and I’m not sure I ever will. Something tells me the developers might soon be moving in (the Corsican boulangerie up the road has already become a Thierry Marx bakery). Over the 10 years of the blog, certain people, both real and imaginary, have returned frequently, but none of these were in my mind at the beginning. The way I see Paris and the routes I have taken just seem to have placed them in front of me, and long may this continue! The buildings of Auguste Perret quickly caught my eye, and the Charcot family have popped up in several places (I would still love to write a book about Jeanne, the daughter), but perhaps strangest of all was my encounter with Urgus Tabarovich. Most blog posts have been investigations into my own interactions with the city, but it seemed early on to me that there were certain themes and areas that could be combined into walking tours. I enjoyed putting these together and wanted them to be free, but it has proven too much work to keep them up to date. You can still find them online though! Whilst I have always been careful to keep myself invisible (this is a blog about Paris, not about me), I have enjoyed putting the spotlight on other people living, working and creating in Paris. The first person I featured was Gina Rarick a journalist turned racehorse trainer based in Maisons Laffitte, but another favourite was Ariane Pasco, a teacher by day and street artist by night! We imagine trips to Paris to be pleasant holiday visits, but experiences in a large capital city can come in many forms. This blog is Paris through my eyes, but I would probably have preferred to be an editor and publisher of multiple viewpoints. Your comments on the blog have given me some of my favourite moments, enhancing the posts or even making me see things from a completely different angle, but perhaps the most moving contribution was from a lady who looked back on a period in her life when she regularly visited her brother at the Prison de la Santé. After running the blog for a couple of years, I began to receive questions from people who had seen or heard about things in Paris that had remained mysterious to them. I haven't been able to solve all of these 'mysteries', but I always enjoy trying! The first was to identify the artist behind a series of creations pasted on the walls of the city. Another long-running theme on Invisible Paris have been postcards. They have led to me to a swimming pool that sank and a graveyard of unwanted statues, but the most rewarding journey was uncovering the story behind the room with a view. The post on this particular postcard turned into a 10 page downloadable PDF document, but it was the human side of the story which made the strongest impression. The fact that I could pick up an old postcard at a fair one day then meet the family behind the 'room' a few months later still seems incredible to me. I would love to see a network of invisible cities across the world, but for the moment there are only two and a half! My friend Tim took the concept to Bordeaux, where it has become an important local resource, and one that will shortly be a little less invisible! By far the most read post on the blog is the investigation into the death of Pierre Curie. The number of hits (and search strings) leads me to believe that somewhere it is a question posed in a school, but I particularly enjoyed working on the post because the answers came uniquely from one of the key resources for the blog; contemporary newspapers. The Gallica online archive run by the French national library is an invaluable tool! The most important event in the decade of the blog has naturally been the publication of my Paris Cityscopes guide for Reaktion Books. 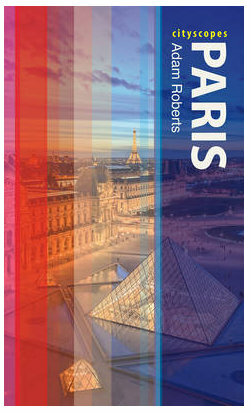 It is not Invisible Paris in book form, but some small elements and themes may have found their way into the guide. The Cityscopes series of city guides are quite unusual - focusing mostly on the history of the city and its contemporary life and culture rather than listing tourist sites and hotels and restaurants, but that makes them unique! I'm very proud of the book, but it would be great if a few more people read it! When you post, I don't miss it. Congratulations on your ten years. Always worth a read, Adam. But I have missed your insight backed by solid research and such engaging writing. Congrats! And so excited to see that my question to you about the man on the ladder made the retrospective. It's been 7 years since I left Paris but I continue to enjoy it vicariously through your blog. Still curious about those aviators near Trocadero...hint hint. Coming regularly to Paris I often just wander. Now a blogger for a year I found myself thinking 'What was the name of that blog I used to read years ago? Has it survived?' Glad to see it has - esprcially as I prompted the Challenge 5 about the white railway cross! Congratulations, Adam, on keeping your IP blog going for 10 years already! It has been my favourite "secret" Paris blog since you started it... but having been distracted from coming to Paris for a few years now, I had to suspend reading your posts because I know that they would just make my yearning to return too excruciating! Today I thought of you again after reading a New York Times travel article "Paris on Foot", and while perusing the comments, I wanted to add one with a mention of your blog and your book to their readers, with your permission. All the very best to you and your brilliant and always inspiring Invisible Paris!